the execution of the original 20-mile light rail line. 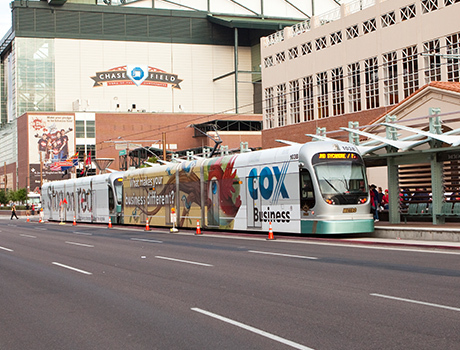 Phoenix Community Alliance took a leadership role in advocating for and influencing the execution of the original 20-mile light rail line. Former PCA President Don Keuth served as vice chair on the original light rail steering committee overseeing adoption, funding and construction. PCA felt strongly about the need for more platforms in the downtown core and withheld its approval until those platforms were included. Additionally, PCA advocated for concrete to be used on the line. Keuth went “door to door” up Central Avenue to secure the additional funding necessary to pay for concrete. Today, light rail has expanded to 26 miles with new lines coming soon, the first connecting Baseline Road to downtown. "I would never consider dropping my membership". "I have been honored to be involved as an Executive Board member of the PCA for over 20 years. Our organization has been in the trenches to help promote Downtown Phoenix as a destination area where people can live, work and play. If you are a stakeholder in downtown Phoenix I urge you to get involved with the PCA organization as this is the organization that is at the pulse of all the downtown activities of development, marketing, cultural and business development. As the Chairman of the Central City planning and development committee I am so excited about the future of downtown and can't wait to be a part of the next 20 years of Downtown Phoenix Transformation!!" - Michael Lieb , Michael A. Lieb, LTD.
"During central Phoenix's "lean times," the Phoenix Community Alliance focused on city-building to help fill-in key puzzle pieces like the Arizona Center, Convention Center, downtown and midtown high-rises, Steele Indian School Park, light rail, and the presence of higher education, among others. After the Great Recession and the current revitalization cycle, PCA is striving to complement city-building with community building... bringing in new voices – residents, neighborhoods, and businesses large and small – for a stronger, more inclusive alliance of the Phoenix community".